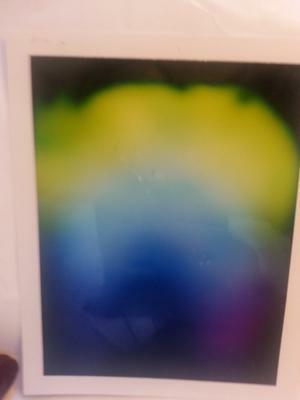 My cellphone is on the right side of the picture (I took the picture with my cell) so please disregard that... can anyone interpret what the colors mean please? This definitely helps! Blessings on your endeavors you are doing well so far! The light yellow indicates that you're struggling, the light blue means that at the moment you're a bit peaceful. The dark blue will come into play meaning you're aflame aid to move on, while the violent means that something magical or inspiring will happen in the near future. Hope this helps, I'm a beginner at reading auras and I'm doing my best by answering this question.